At the height of the 1974 floods the Lord Mayor of Brisbane, Alderman Clem Jones, ordered the gates of Somerset Dam be shut to prevent the release of floodwaters defying the recommendations of the dam operators. An urban myth developed that Clem Jones saved Brisbane. But did he? Somerset Dam, completed in 1959, was constructed on the Stanley River, a tributary of the Brisbane River, as a dual purpose structure to provide a water supply and to mitigate flooding in the downstream areas, particularly in Brisbane and Ipswich. 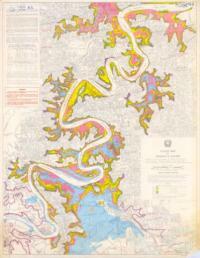 In 1974 it was the only structure in the system that could provide any significant flood mitigation. 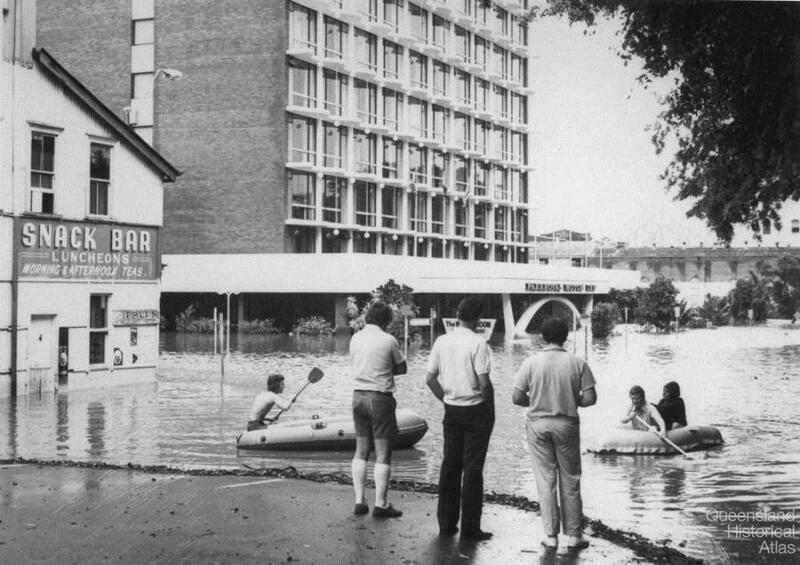 As Cyclone Wanda’s associated monsoonal trough dumped 681 mm of rain on Brisbane over three days from 24 January 1974, the Brisbane River steadily rose, augmented by the Stanley and Bremer River flood water and metropolitan creeks. On 1.30 pm on 28 January the flood height reached 6.4 metres on the Port Office gauge. Thirty minutes later, Somerset Dam’s gates were opened to discharge the building floodwaters, in accordance with the dam’s design intent and operating manual. Community consensus thought it madness to release more water during a flood. 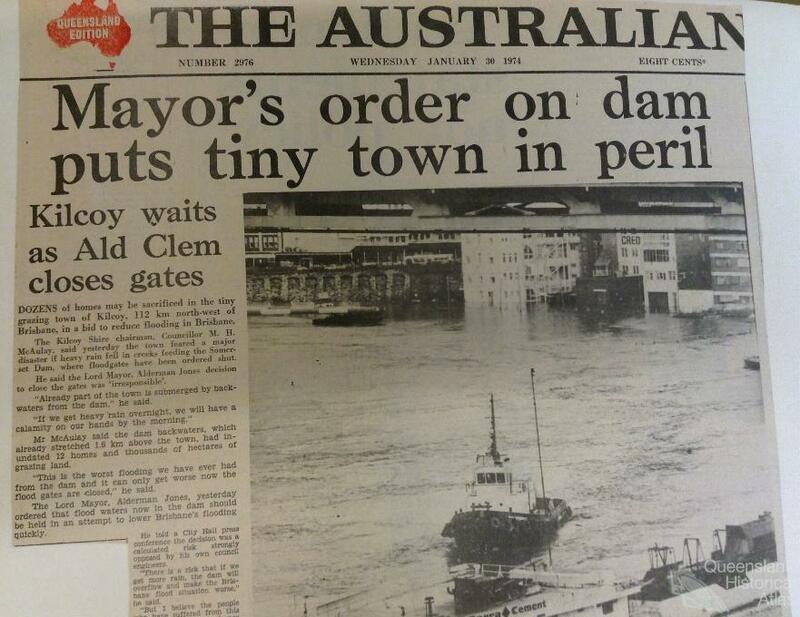 Around midnight on 28 January Alderman Clem Jones, rang the office of Bernie O’Connell, the Brisbane City Council Chief Engineer, demanding the Somerset Dam gates be closed to free Ipswich and Brisbane immediately from the floodwater. Council staff explained that the Stanley River flood waters must be held by the dam and then released slowly by gates after the Upper Brisbane River flood peak passed downstream of the Stanley Junction. Slow release prevented additional flood waters damaging Ipswich and Brisbane. 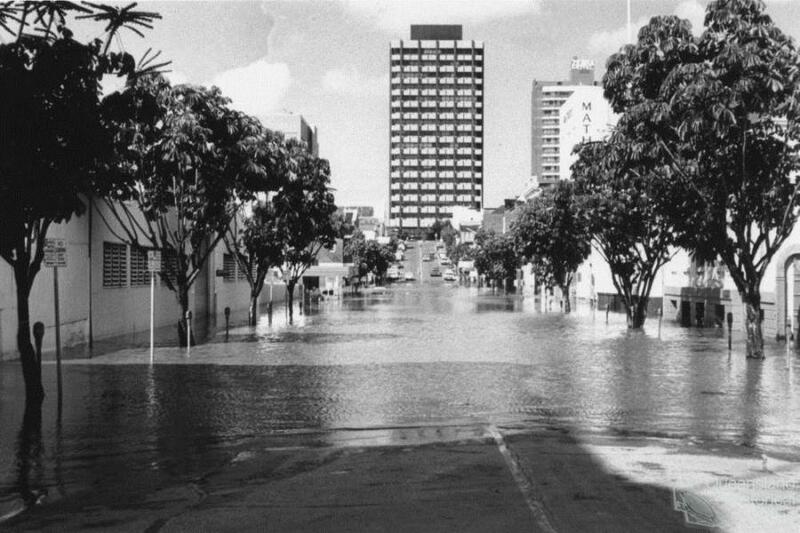 As released water took 36 hours to reach the upper limits of Brisbane, 48 to the central business district, gate closure would have no immediate impact. Once the flood passed, the gates would be closed slowly to prevent river bank collapses as the water levels fell, leaving the water supply storage full and the flood storage empty in readiness for the next flood. The current strategy would free dwellings as quickly as possible without increasing damage in Kilcoy and Esk. Immediate release was necessary as further rain was forecast, putting a full dam at risk of destruction or flooding thousands downstream. The Lord Mayor would have none of it. The dam gates must be shut to save Brisbane. Clem Jones and his staff argued all night. Clem Jones pulled rank. He insisted that as an elected representative and Lord Mayor he must be obeyed. The Chief Engineer consented to close the gates, Clem Jones accepting full responsibility for the consequences. At 11am on 29 January Clem Jones called a press conference, announcing the closure of the Somerset Gates at 2.30 pm. ‘I take full responsibility for the decision’, . . . ‘taken against the strong advice of senior Council officers’ . . . [but] . . .’under the circumstances, we should take a calculated risk’. ‘This is a tough decision, but if I hold back on making this one I shouldn’t be in office’. At 3 pm on 29 January the flood level in the Brisbane River started to drop rapidly as hydrologists had predicted it would on the outgoing tide. Clem Jones, proclaimed to be the hero, he had defied the bureaucrats and saved Brisbane, a story that has survived subsequent decades. Two key questions emerge. Why did Clem Jones order the closure? Then why did he wait? Clem Jones’s behaviour was characteristic of him. His admirers described him as energetic, intellectually astute, decisive, visionary, an impressive media campaigner and formidable debater, while his detractors labelled him arrogant, dictatorial and inflexible. He demanded unswerving loyalty from his caucus and staff, acted without consultation and faced with dissension could resort to volcanic outbursts of intimidation and abuse. He was a solutions-driven politician and wanted to be seen as effective in saving Brisbane from flood. Former Brisbane City Council engineer, Geoffrey Cossins, suggests Clem Jones may have been ill-advised by the Irrigation Commissioner about the efficacy of his strategy. However, Brisbane City Council officers advised Jones of the 36 hours delay between gate closure and impact in Brisbane. Clem Jones predicted that flood levels would fall, with a flood warning at 2 pm on 28 January reporting that floods in the Bremer River and Brisbane River above Mt Crosby were receding and that Brisbane river levels would remain stationary between 2 am and 4 pm on Tuesday. The 5am flood warning on 29 January forecast a lower flood peak on the high tide at 2 pm. Clem Jones seized his opportunity, timing the gates closure for 30 minutes beforehand ensuring almost instant effect. In reality closure would have little effect in Brisbane until noon, 31 January. Closure started at 2.00 pm and despite Clem Jones’ further intervention to have the gates shut immediately rather than gradually, the Chief Engineer stood firm and the gates were finally fully shut at 2.15 am on 30 January. 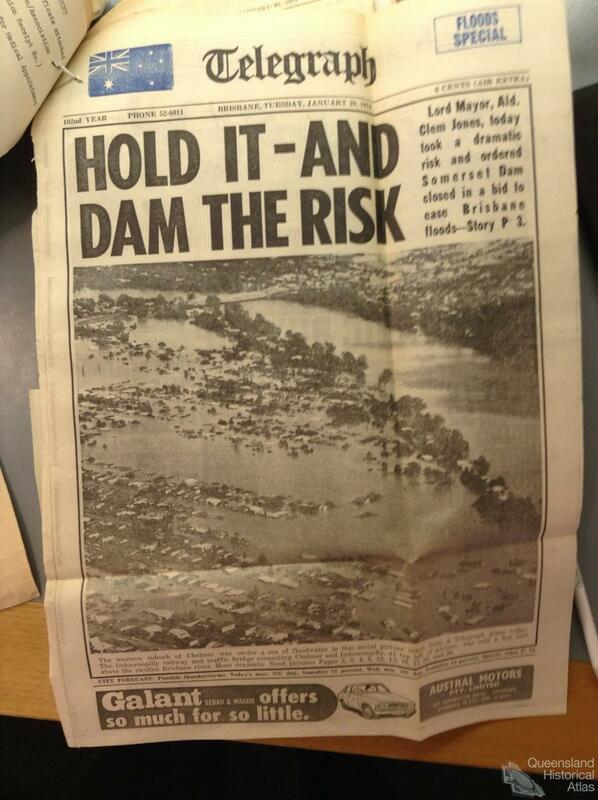 Somerset Dam was at full capacity for six days, with no ability to mitigate any subsequent floodwaters. 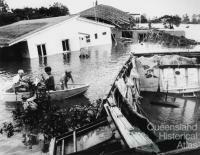 Rather than save Brisbane, hydrologists argued that Clem Jones put the city at great risk. On 5 February 1974 Cyclone Pam, ‘one of the biggest cyclones on record’, developed 600 km east of Tewantin but fortunately remained approximately 600 km off the coast. If it had crossed the upper catchment with drenching rains, it would have caused catastrophic floods as Somerset Dam had no mitigation capacity. 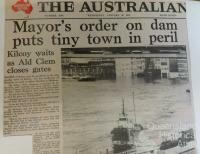 The closure of the gates could not, and did not, reduce flood levels in Ipswich and Brisbane as Clem Jones claimed. Furthermore, Clem Jones put Kilcoy, a town in the Upper Brisbane River catchment, immediately upstream of Somerset Dam, ‘in peril’. Kilcoy Shire Chair, Councillor M.H. McAuley, branded the decision ‘irresponsible’. Lake Somerset reached a record level of 106.7m, with the water entering Kilcoy. Houses were evacuated, 12 flooded and the town was isolated for a week. Fuelling existing tension between Brisbane and Kilcoy, Clem Jones defended his decision. ‘I took the risk – a small number of homes in Kilcoy could suffer when hundreds of homes would be helped in Brisbane’. When Clem Jones ordered the gates be re-opened, his justification seemingly contradicted his earlier decision. ‘It would be two days before the water backlog reached Brisbane and then it would no longer be a threat to the city’. Somerset Dam’s gates were re-opened on 31 January. Councillor McAulay declared ‘I’m pleased common sense has prevailed’. 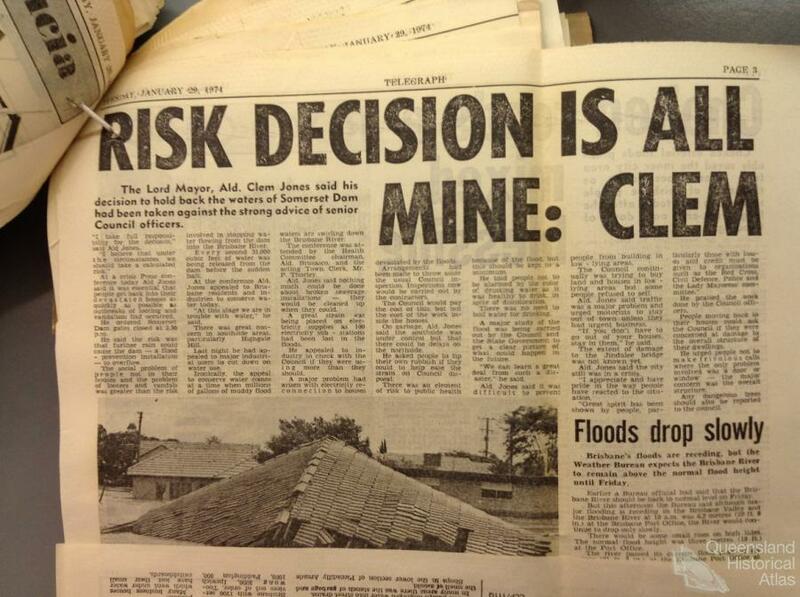 In Parliament Clem Jones’ critics decried his actions as a ‘great political gesture’, ‘grand-standing in an attempt to gain some cheap political mileage from the disaster’, a cynical ploy to win urban votes at the expense of Kilcoy when he knew the decision would have no effect. In the aftermath of the 1974 floods the State Government introduced legislation that the person in charge of flood operations for all dams should be a qualified and experienced engineer, thereby removing political influence. In times of survival the action of any political leader is under intense scrutiny. Decisions such as these would henceforth be left to ‘experts’, but the controversy continued with each subsequent flood. AJ Shields, ‘Synoptic Meteorology of Flood Period, Proceedings of Symposium’, January 1974 Flood Moreton Region, The Institution of Engineers, Australia, Queensland Division August 1974.